Injection of water into an oil reservoir to increase recovery was first attempted in Oklahoma on an oil lease 5.8 miles east of this location. From that effort a recovery method previously used in eastern fields was adapted to conditions found in this area. Since then, waterflooding to obtain greater oil recovery has spread to adjoining states and around the world. 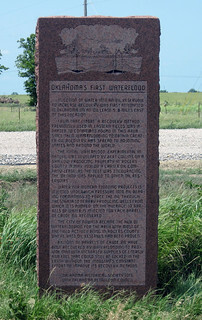 The initial waterflood, experimental in nature, was developed by Bert Collins on a shallow producing property in Rogers County in May 1931 on a Carter Oil Company lease. As the test was encouraging, the test was applied to other oil reservoirs. Water for modern flooding projects is injected under high pressure into oil bearing formations to force the oil through the strata to nearby producing wells from which it is pumped. On the average, 10 barrels of water is injected for each barrel of crude oil recovered. The city of Nowata became the hub of waterflooding for the area with most of the field activity being in Rogers County, where vast oil reserves had been proven. Billions of barrels of crude oil have been recovered by waterflooding to provide man with increased supplies of energy and fuel that could still be locked in the Earth without the industry's constant effort to improve its recovery methods.